Definition at line 36 of file client-to-nlsr-readvertise-policy.hpp. If the route origin is "client" (typically from auto prefix propagation), readvertise it using the default signing identity. 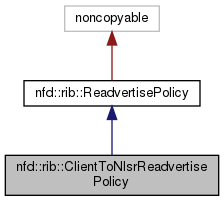 Definition at line 32 of file client-to-nlsr-readvertise-policy.cpp. References nfd::rib::RibRouteRef::entry, nonstd::optional_lite::nullopt, nfd::rib::RibRouteRef::route, and ndn::nfd::ROUTE_ORIGIN_CLIENT. how often readvertisements made by this policy should be refreshed. Definition at line 43 of file client-to-nlsr-readvertise-policy.cpp.